*Disclosure- I received the above mentioned product courtesy of the sponsor for the purpose of this review. All opinions are genuine, based on my experience with the product, and have not been influenced by promotional items. To keep things simple, we split up our family holiday visits between families. We go to my mom's house for Christmas Eve dinner, then on Christmas Day, we go to my in-laws. While splitting up the days saves time, it does mean that I have to make 2 separate dishes to take to each house. Normally, I'd take a dessert, but this is the season of over indulging on all those cookies, I like to find an appetizer or side dish to add to the meal. 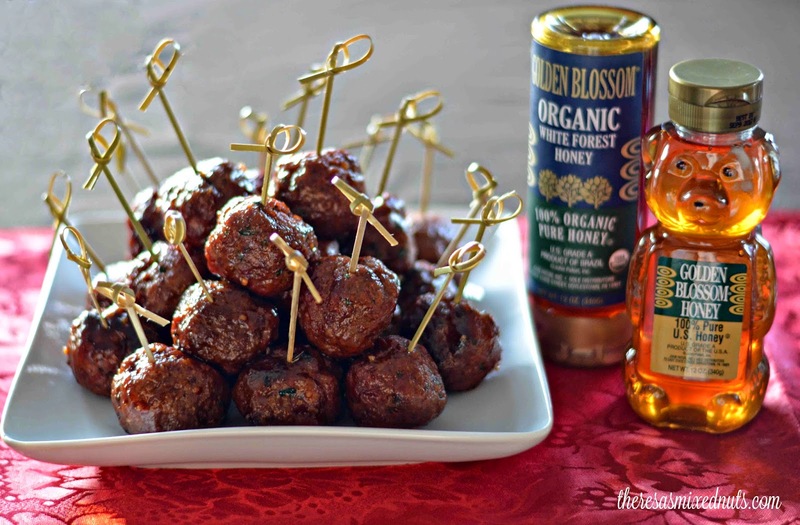 I was browsing through the Golden Blossom Honey Recipes and when I saw these Sweet & Sour Meatball Appetizers, I was like Bingo! With all the hustle and bustle that goes along with the holidays, I do not want to spend more time in the kitchen than necessary. These meatballs are made right in the oven, and only take about 20 minutes to make. Best of all, they can be made ahead of time, then just reheat before serving! In a bowl combine ground beef, breadcrumbs, egg, salt and parsley. Mix well. Shape into approximately 48 1-inch balls. Place balls on a jelly roll pan and bake for 4 minutes. Stir and continue baking until meat is cooked through, about 4 more minutes. Remove from oven. Heat olive oil in a large skillet. Add garlic and sauté until just tender. Add remaining sauce ingredients and bring to a boil. Cook 3 minutes. Add meatballs. Simmer 3 more minutes stirring to completely coat meatballs and sauce thickens. You can find this recipe, as well as many more appetizer recipes right on the Golden Blossom Honey recipe page! Be sure to follow Golden Blossom Honey on Facebook and Twitter to stay up to date on new products and promotions. Do you prefer to take an appetizer, side dish, or dessert to your holiday gatherings? I feel like Pat here, saying I have never tried something. But I have never tried agave. They were giving out samples of a smoothie made with agave at Costco last week and I just couldn't bring my self to take the sample. It was a green smoothie and for some reason, I just can't get past the looks of them. I have to go to a Christmas party tomorrow night and I might make these. They are easy enough and sound awesome! They really are! Just toss them in the crockpot to stay warm and you are good to go! Weirder than The Dazzzling Dezzzmeister? Is that a fact? Wait, talking to inanimate objects isn't such a weird thing. I mean, I talk to my colleagues all day long and.... well.... you know. What about Daisy? I'm sure she's a great cook! Ooo...these look GOOD! I prefer to take a dessert, but these would be great, too! These look so delicious. I have always struggled with meatballs for some reason but I would love to try these out. I'm thinking these would go over well at game day. My beloved Ohio State Buckeyes are in the Sugar Bowl and these may be on the menu. They look yummy. I love meatballs and have never had sweet and sour meatballs. This is something worth trying. I would probably eat them all! I usually make a cheese ball, a relish tray, and a cookie plate. In our family you just bring whatever. I was thinking about making those rum balls that you had on here. I'd have to figure out how to separate them from the kid's area though. This recipe does look great! I love sweet and sour everything--when I make stuffed cabbage I cook it in a sweet and sour sauce (sauerkraut and sugar)--now I never thought of using honey--I think I may try that. I always have Golden Blossom in the house--it gets drizzled all over Challah or rye bread or any other bread I happen to have around! I love meatballs. One of my favorite foods ever! Yum one of my faves! I love sweet and sour everything but meat balls? The best! They look soooo good! This is similar to a sweet and sour meatball recipe I already make. Next time I am going to try it this way. Wow, these look super yummy. It is very hard for me to get beef though so I'd go with ground chicken. I don't remember having a sweet and sour meatball - I have to try this one. Those look so delicious! My son would be all over those! How I wish I would have seen this post yesterday! They would have made the perfect appy for today's festivities. Maybe for my families Christmas I will make these. Have a great weekend Theresa! ok I HAVE to try these meatballs. I've never had sweet and sour meatballs before. They wouldn't last a minute in my house. I actually use that honey as well and have it in my kitchen as I type. I like to bring a dessert with me to a pot luck dinner. I have a big sweet tooth. These meatballs look so delicious i will have to try to make them. They just look SO good. I need to try them! Most food items that have sweet & sour wins in my book. Looks delish! Anything that can be done quickly is what I would take to a party.Those meatballs looks delicious! My family's different - we just let whoever's hosting the party do all the work. Unless the host specifically requests we bring a particular thing. 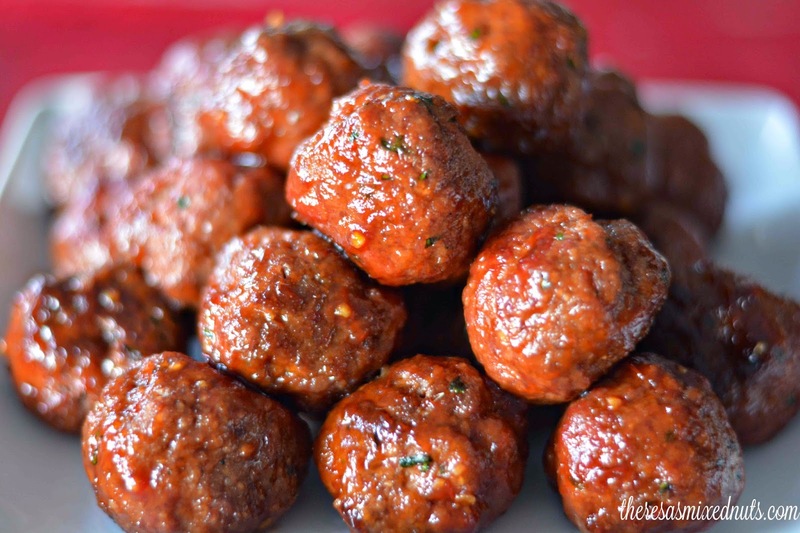 Sweet and sour meatballs are one of my favorite appetizers. I haven't made them this way though and have to give it a try! Amazing! Looks so different and delicious. Love the recipe and it sounds like a healthy one as well. I hope my kids would really love this. Yummy yum. I am a huge fan of meatballs as an appetizer. Thank you for the recipe for the sauce. I don't normally cook my own meatballs I use the frozen kind but I am always looking for a good sauce to make with them. As far as appetizers, this looks divine. Of course, my preference is to take a dessert - in hopes there will be plenty left over, and I'll have to take the rest home. Have a great week, Theresa. Oh wow those meatballs look and sound amazing! I'll be trying out this recipe! 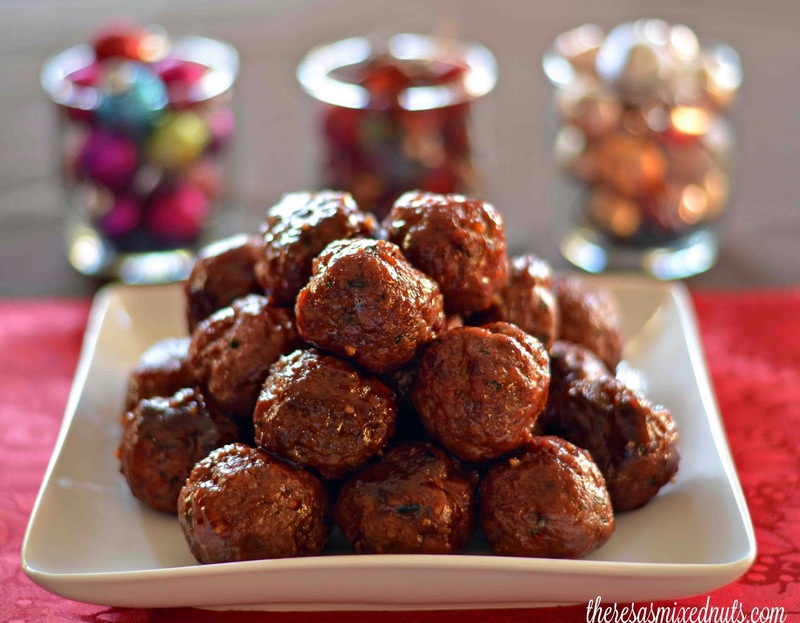 These meatballs look amazing and I am going to make them for the Super Bowl because they would be perfect appetizers. They look easy to make!